Andrew Jackson, seventh president of the United States and the last to be born in the colonial period, was the son of Andrew and Elizabeth Hutchinson Jackson. The elder Jacksons and their two sons, Hugh and Robert, moved to North Carolina from Carrickfergus, Northern Ireland, in 1765 and settled in the Waxhaw region of Mecklenburg (now Union) County. Named for a band of Indians, this area was considered to be "a rich oasis in a region of pine barrens," and it extended across the unmarked boundary between the two Carolinas. The elder Jackson died in February or March 1767, and Mrs. Jackson took his body to the Waxhaw Presbyterian Church, about twelve miles away in South Carolina, for burial. Returning home, she gave birth to a son and named him Andrew. Whether she actually arrived at home or stopped at the home of relatives is not known, and the precise birthplace of Jackson is in dispute. Andrew Jackson briefly attended an old field school and although very young took part in the American Revolution. He never officially enlisted but served as a courier for General William R. Davie, and the two became close friends. Davie, in fact, is said to have been something of a hero to young Jackson. Andrew and one of his brothers were captured by the British and imprisoned for a time. Both of the two older Jackson brothers lost their lives in the Revolution, and Mrs. Jackson fell victim to a fever contracted while nursing the wounded in Charleston. Orphaned at fourteen, Jackson worked in a saddler's shop and taught school. He then studied law at Salisbury under Spruce Macay in 1784–85, and was admitted to the bar in Rowan County on 6 Nov. 1787. For a time he practiced there as well as in Guilford County. When Jackson was appointed solicitor of the western district of North Carolina, comprising what is now the state of Tennessee, he and a friend, John McNairy, moved across the mountains to Jonesboro. Jackson soon moved to Nashville and there lodged with the widow of John Donelson, the founder of the town. He married the widow's daughter, Rachel, when they believed her divorce from a jealous husband was final. Much to their embarrassment they learned later that the divorce was not final, and they were married a second time. They had no children of their own, but adopted her nephew who took the name Andrew Jackson Donelson. An avid land speculator, Jackson acquired many acres including his homesite, The Hermitage, near Nashville, where he lived as a cotton planter. His political career began when he was a member of the convention that framed Tennessee's first constitution in 1796, and he was elected as the state's first representative in Congress. He resigned at the time of the so-called Blount Conspiracy and was elected to the Senate. He also served as a Superior Court judge. Politically weakened by his association with Aaron Burr and his killing of Charles Dickinson in a duel, Jackson lived as a country gentleman until the War of 1812. 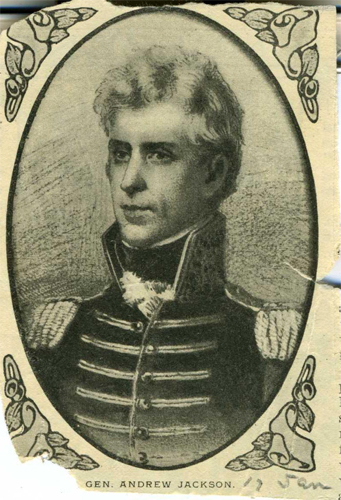 Attaining the rank of major general, he acquired fame by defeating the Indians at Horseshoe Bend and the British at New Orleans. He was severely criticized, however, for the "Seminole Affair" of 1818, in which he invaded Spanish Florida and executed two British subjects. Nevertheless, he was appointed governor of Florida after its purchase, but he soon returned to Tennessee where his friends were organizing a campaign to make him president. After serving briefly in the Senate, Jackson resigned and concentrated on his presidential hopes. He was triumphantly elected in 1828 and reelected in 1832. His tenure was noteworthy for the great increase in the power of the president. He was also instrumental in the election of Martin Van Buren as his successor. Jackson spent his last days at The Hermitage and was buried in the garden there. John S. Bassett, The Life of Andrew Jackson (1911). Biog. Dir. Am. Cong. (1961); DAB , vol. 9 (1932). Max F. Harris, The Andrew Jackson Birthplace Problem (1963). Marquis James, The Life of Andrew Jackson (1938). James Partin, Life of Andrew Jackson , 3 vols. (1860). William B. Sumner, Andrew Jackson (1899). "Andrew Jackson." Presidents, White House. http://www.whitehouse.gov/about/presidents/andrewjackson (accessed January 8, 2014). Heiskell, Samuel Gordon. Andrew Jackson and early Tennessee history. Nashville, Tenn: Ambrose Printing Company. 1918. https://archive.org/details/andrewjacksonear00inheis (accessed January 8, 2014). Frost, John. Old Hickory; young folks' life of Gen. Andrew Jackson. Boston: Lee and Shepard. 1887. https://archive.org/details/oldhickoryyoungf00fros (accessed January 8, 2014). Search Results for Andrew Jackson from Archive.org. (accessed January 7, 2014). 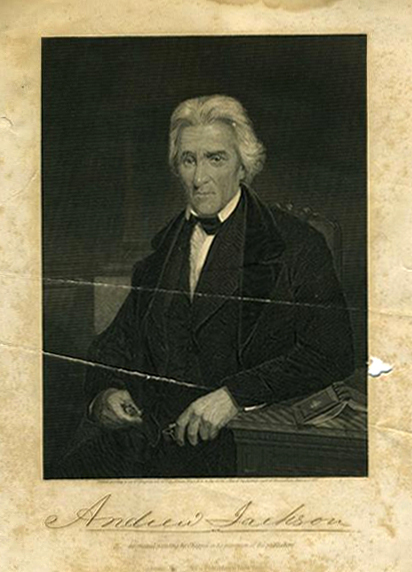 "[Print of an engraving of Andrew Jackson], Accession #: H.1946.14.102." 1878-1890. North Carolina Museum of History. (accessed January 8, 2014). "[Clipping of a drawing of Andrew Jackson from "The Messenger"], Accession #: H.1946.14.181." 1900-1920. North Carolina Museum of History. (accessed January 8, 2014). 1 January 1988 | Folmsbee, Stanley J.
I love presidets great information!